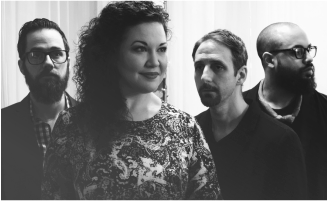 BOHÈMES, a modern chamber ensemble from Chicago, has produced a new, fresh, creative, and approachable take on classical, operatic, and contemporary vocal repertoire. Its members have participated in an impressively wide array of collaborations including those with the Lyric Opera of Chicago, Jazz at Lincoln Center, legendary reggae producer, The Scientist, and American Social Practice installation artist, Theaster Gates. The ensemble’s unorthodox instrumentation (voice, electric guitar, bass, and drums/percussion) creates both exciting challenges and opportunities when interpreting a body of music largely written for orchestra or piano, leaving the listener with an unprecedented and unforgettable aural experience.